The Clarence Lions Club Pancake Breakfast tradition. State Senator Mike Ranzenhoffer at the pancake breakfast in 2010. Hhmmm, you can help your community by eating some pancakes. Sound like a win/win situation. For over 20 years, residents of Clarence and the surrounding communities have flocked to the Clarence Lions Club’s annual pancake breakfast. This year the tasty fundraising event is scheduled for Sunday, February 7th from 8:00 a.m. to 1:00 p.m. and is held at the Clarence High School (9625 Main Street). 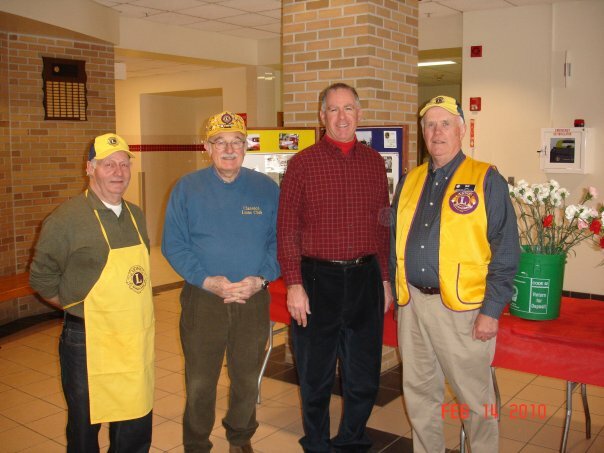 The fundraiser helps the Lions Club with their charitable endeavors within the community. The service club has a long-standing mission to help causes or situations that involves people’s eyesight or vision. A wonderful organization, indeed. Tickets for this event are $7 for adults and $4 for children ages 5 to 12, and free to children younger than five. Admission includes pancakes, eggs, sausage, juice, milk and coffee. This is a great way to support a club and our community. Does the lions club still take donations of no longer needed glasses? If so, where can I drop them off? I live in Clarence center. Steve, you can take your spare eyeglasses to the Lion’s collection box in the foyer of the Clarence Library.